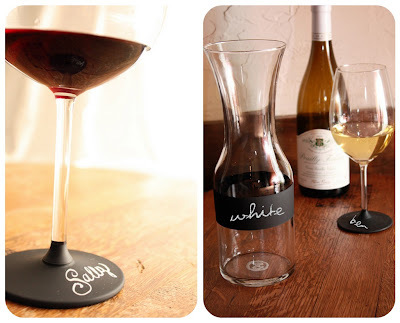 A fun easy, cheap & unique way to mark your glasses at your next wine party. These were made by Chalkboard China who specializes in"Chalk Friendly" items. This idea can be easily executed at home with some store bought chalk board paint or even make your own chalkboard paint at home. The plus of making at home paint is that it does not have to be black, you can create any color you choose to coordinate with your decor or theme. Armed with paint, a brush, blue tape and chalk, you've got yourself a fun way to keep your wine and cheeses proudly marked! I will be making some soon for a Halloween motif, the possibilities are endless! I will be painting all the glass vases and containers in my office soon.